We found Nemo and he’s on a wedding cake! This amazing three-tier novelty wedding cake is a creation from Hockleys Cakes located in the United Kingdom. They are specialists in the wedding cake biz across the pond and I am loving their designs and can’t wait to feature more in the weeks to come. 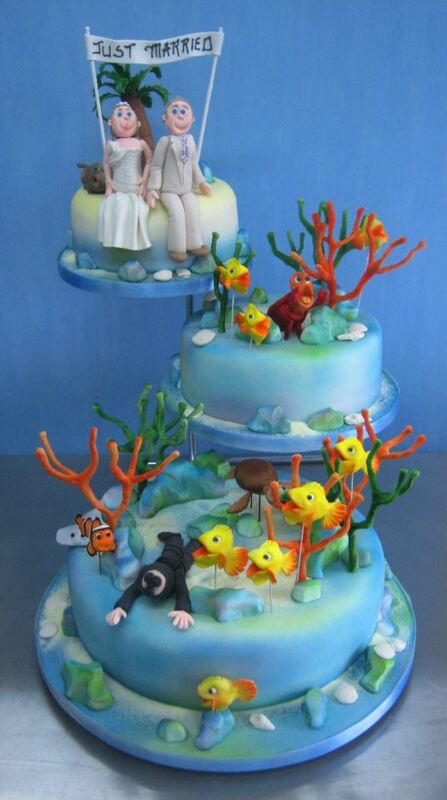 But right now let’s talk about this Nemo wedding cake because it’s just amazing! This novelty wedding cake features an undersea scene complete with Nemo, Crush the totally cool sea turtle, and of course the bride and groom are sitting atop the cake under a palm tree. I think I even spy Sebastian hanging out by the coral in the middle tier! Michael Hockley said the bride and groom for this cake were “avid” Finding Nemo fans, and the top tier of the cake reflected their honeymoon destination! How romantic! If this cake doesn’t make you long for a beach wedding, I don’t know what will. The details on the cake are exquisite and everything is hand-crafted from sugar – which just adds to the incredible-ness of the cake. Wouldn’t you love to see this cake at your beach-themed wedding? And of course, it would be so much fun for the Disney loving bride out there! 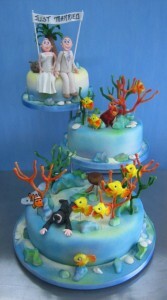 The Nemo wedding cake is just one of many “novelty” designs from Hockleys. You can find more amazing creations at their website and on their Facebook page! And keep checking back here at A Wedding Cake Blog because we’ll be featuring more fun and fancy creations from Hockleys in the weeks to come.